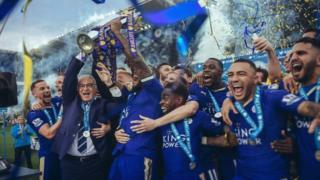 Leicester's universities are hoping that Leicester City's fairytale success in football could also bring them a happy ending, in terms of raising their global profile and attracting overseas students. Will it mean being able to stop explaining to non-English speakers how to pronounce "Leicester"? And could top-scoring Jamie Vardy find himself sitting next to a vice chancellor on a flight to a Champions League match next season? The Premier League has few rivals in terms of a global following, with matches televised to an audience of three billion people. Even in the most remote village in China or sub-Saharan Africa, you can see children in a Chelsea or Manchester United football shirt. And Leicester's two universities - the University of Leicester and De Montfort University - will want to tap into the Premier League's global fanbase. The manner in which Leicester won the league - against all expectations - makes it even more likely that global fans will be aware of their triumph. This name recognition makes it easier for universities to start conversations with prospective students and donors. "It doesn't matter where in the world I go, whenever people see my name badge you can guarantee they will be desperately keen to speak about the team," says Leicester University's president and vice chancellor Paul Boyle. Professor Boyle expects an increase in applications this year and De Montfort University is already claiming a 60% rise. At the other end of the premiership table, the University East Anglia is concerned that Norwich City's possible relegation might hit their student recruitment for next year. Vice chancellor David Richardson says the football team's premiership status has helped the "international profile" of the university and the city. The Premier League is very popular in China, home to the biggest number of international students at Leicester University and the world's biggest market for overseas students. This gives universities which share a name with a popular Premier League club an edge in the competition for Chinese students. "In the past, I had to tell people we were 45 miles south of Sherwood Forest which they knew because of Robin Hood," says Christopher Shaw, Leicester's assistant director of fundraising and alumni relations. "Now we have to do less work to explain who and where we are." Professor Boyle says images of his students celebrating the team's success have been shared around the world on social media and give a positive impression of student life at the university. The university held a "back the Blues" event in which a conga line of excited students and staff snaked around the campus and the football club's logo was painted onto the car park. This week, De Montfort University students will celebrate with Leicester's players as the trophy is paraded on campus. These scenes are reminiscent of the "game day" phenomenon at colleges in the US, where crowds of students celebrate the university team in the quad, accompanied by marching bands and cheerleaders. These are major events on colleges' social calendars, and are used for recruitment and fundraising. Professor Boyle, who studied in Colorado for a year, says he recognises the comparison but notes UK universities have a long way to go to match the role of sport in US higher education. "The sporting culture there is much more advanced and that is not something we are going to be able to recreate overnight, but there is no question that sports teams and facilities can be an asset for universities," he says. Other universities have forged links with their local clubs. In Germany, the Technical University of Munich says Bayern Munich's international profile has helped to "export the brand of Munich into China" and the university provides medical support for the club's junior players. Leicester's universities are now looking to strengthen their links with the Foxes. De Montfort University teaches English to Leicester's international players - Japanese player Shinji Okazaki passed an English exam three weeks before Leicester sealed the title. The university now plans to send 100 students to intern at the club and open a recruiting office in Thailand with the help of the owner's company King Power Group. The university's student football teams will even accompany the club on its pre-season tours of Barcelona and Los Angeles. Leicester University gave the club's owner an honorary degree in January and hopes to develop its relationship with the club over the next year. Dr Tim Westlake, director of student experience at Manchester University, says his university has benefited from accompanying Manchester United on pre-season tours in south-east Asia, where they hold alumni and recruitment events. But he warns the football connection should only be the start of universities' conversations with prospective students - and that choosing the right course is more important. So as Leicester City's management makes plans for next season, university administrators will also be hard at work over the summer. They might be in a race against time, if Leicester University's fundraiser Christopher Shaw is to be believed. Looking out at the King Power Stadium from his desk, the 49-year-long fan of Leicester City says he has been through "a lot of suffering" following the team. "This is Leicester City, it would not surprise me if we were relegated next year," he says.